PARADISE, Calif. – Amid a throat-piercing haze, disabled retiree Michael French walked with effort across a parking lot to submit a DNA sample to California authorities that he hopes will help him locate his missing niece. French, 62, said he and other relatives have searched for Wendy since a fast-moving wildfire – the most destructive in California’s history – swept through 11,000 homes and buildings in Paradise and adjoining mountaintop communities on Nov. 8, leaving at least 76 dead. As firefighters battle to contain the deadly Camp Fire, authorities intensified efforts to identify the lost and the dead. Teams of volunteers in white protective gear searched blackened ground and family members came to makeshift DNA centers where their mouths were swabbed to help identify victim remains. On Saturday, Butte County Sheriff Kory Honea said that the list of people unaccounted for was up to 1,276 and that 63 victims have been tentatively identified. On Friday authorities released more than 600 names in an effort to identify those who had been found by friends and relatives. The astonishing tally raised fears that the death toll would rise exponentially. On Saturday, Honea urged people to look at the list and contact the sheriff’s office if they see their name on the list. The lengthy list confused even President Donald Trump, who tweeted Friday that “as many of 600” people could have perished in the flames. “Burned beyond recognition, they can’t even see the bodies, it’s incredible,” said Trump, who is scheduled to visit the area Saturday, in an interview with “Fox News Sunday” anchor Chris Wallace. 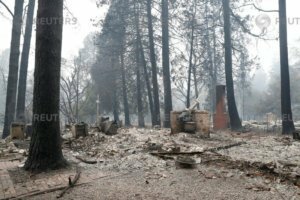 Authorities and residents of Paradise – a community of 26,000 residents nestled in the Sierra Nevada foothills – said the death toll will likely rise in this town where many came to retire and escape the bustle of the city, though it’s unclear how high. Among the residents are many elderly or infirm who may have been unable to flee as the flames approached. The Camp Fire has consumed 149,000 acres – an area the size of Chicago – and is 50 percent contained. But multiple fires continue to rage across the state. In Southern California, the Woolsey Fire has blazed across an area from Simi Valley to the multimillion-dollar beach homes in Malibu. At least three people have been killed in that fire.